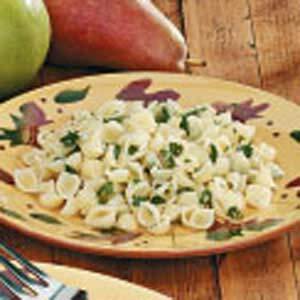 Garlicy, buttery, cheesy pasta. Great as a side dish with any meat - or I like them for lunch just by themselves. Use Gluten-free pasta, if desired. Cook pasta according to package directions. Meanwhile, in a large saucepan, saute garlic in butter. Remove from the heat. Drain pasta; add to garlic butter. Stir in the Parmesan cheese, parsley, salt and pepper; toss to coat. Yield: 4 servings.